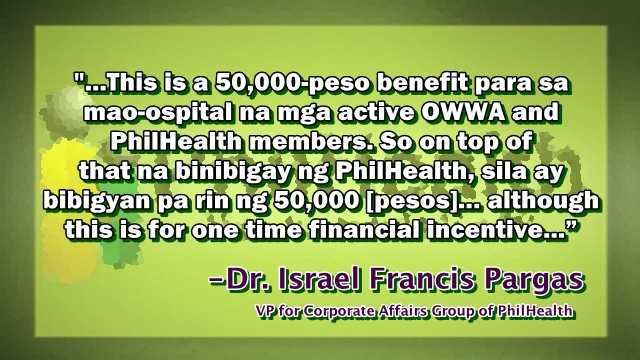 As an OFW, do you know that OWWA and PHILHEALTH has introduced a program called OFW MEDPLUS? The P150 million budget for SMAP or the Supplemental Medical Assistance Program for OFWs is a financial support up to P50,000 that are OWWA members undergoing treatment for fatal or dreaded illnesses such as cancer, kidney ailments, emerging infections like Zika, Mers, Ebola and other illnesses that requires long medication and extensive medical procedure. 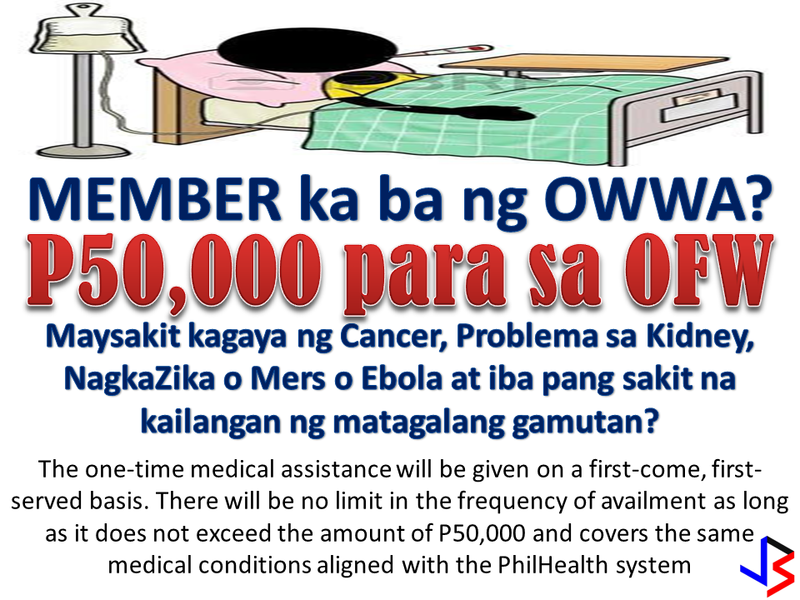 According to OWWA: "It will be given on a first come, first served basis on the amount allocated...there will be no limit in the frequency of availment as long as it does not exceed the amount of PhP50,000 and covers the same medical conditions aligned with the PhilHealth system." HOW TO AVAIL OF MEDPLUS or IMAP? Supplemental Medical Assistance Program for OFWs or MEDplus is a one-time financial assistance at a maximum of FIFTY THOUSAND PESOS (P50, 000.00) extended by Overseas Workers Welfare Administration (OWWA) in equivalent to Philippine Health Insurance Corporation (Philhealth) benefits through identified case rates. This serves as a medical relief for active OWWA and Philhealth member-OFWs who are afflicted with dreaded diseases and were hospitalized, either at the jobsites or while in the Philippines. Program beneficiaries may utilize the maximum benefit in the amount of FIFTY THOUSAND PESOS (P50, 000.00) per member of only one dreaded disease originally diagnosed even if the beneficiary has multiple illnesses. Multiple availment is only allowed provided OFW has not maximized the program in the first availment and that it has the same dreaded disease. Availment is within the validity of OWWA membership with 60-day extension. Eligible availees of MEDplus are all OWWA and Philhealth OFW members, active at the time of hospitalization and diagnosed with dreaded diseases as listed and identified by Philhealth. Duly accomplished MEDplus application form. Original copy of Philhealth Benefit Payment Notice (BPN) – a report of actual payments made by Philhealth to one’s confinement/availment. One (1) copy of passport-size picture. Proof of OWWA membership contribution. Duly notarized Special Power of Attorney (SPA) executed by OFW, if OFW is abroad and the filer-claimant is the next-of-kin (NOK). Philippine Statistics Authority (PSA) - Authenticated death certificate of deceased OFW and marriage contract or birth certificate of NOK-claimant, if the OFW is deceased. 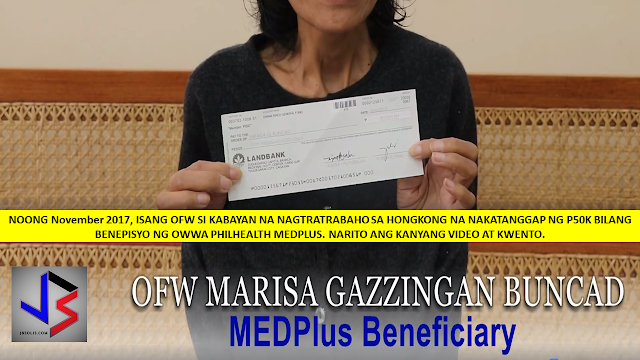 OWWA has always been true to its twin mandate primarily in protecting and promoting the well-being and delivering useful welfare services and benefits to all OFW members hence the approval of MEDplus in partnership with Philhealth. OFWs are encouraged to update and activate their membership with OWWA & Philhealth as MEDplus serves as an additional to OFWs’ health benefit. For further inquiries, OWWA RWO 10’s hotline is 0917-548-0033 or (08822) 722863.